Soon it will be our 2nd week. This is the week of many names – hell week, inner critic week, the week of doubts and loss of enthusiasm. Whether your words have been flying with ease or you’ve been doling them out at a snails pace, don’t worry because even if you feel stuck at sea, wondering why you ever started this journey, know that this is a normal and typical response and it will pass. Believe me. It will! Right now though – Give yourself credit. You decided to write a novel and you’ve spent a week at it already. You’re farther ahead than most people. Yay you! Take a moment and let that settle in. Hang onto that feeling and know that we’ve all experienced the meh waterway to some degree or another and we can navigate through that. 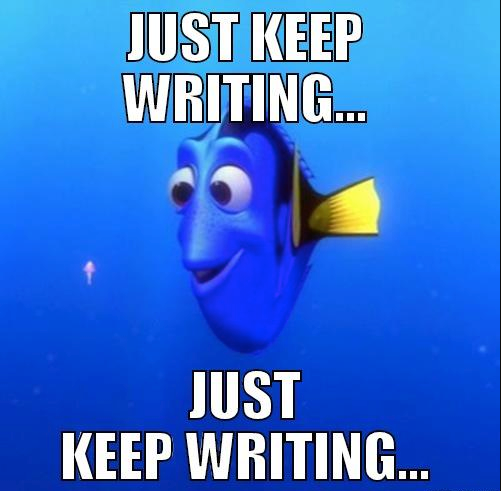 Trust that you can too and just keep writing! Seriously. Even just 100 words a day – one paragraph or even 1 line. Don’t give up! One word after another builds sentences and sentences build paragraphs and paragraphs create pages. With one word at a time, you’ll get through this week and be well on your way to 50,000 words. Perhaps you’d like a (small) break and have some fun. Check out our NaNoLansingisms thread and get a chuckle or share a chuckle. Or ask for some or share some of your strategies for helping yourself through the rough patches in our Help Desk Thread. Or perhaps you are a bit competitive and are encouraged by seeing where you stand against your fellow wrimos – if that’s the case come post something on our NaNo Faces thread to be added to the graph. Or participate in the Wrimoverse Word Crawl – all are welcome whether you are doing Wrimoverse or not. And to help keep you motivated and moving forward, here are our write ins for this week! Host: Flint MLs for more information and to RSVP see this thread. You can coordinate carpooling there also. And because this email is long enough, for those of you who are participating in Wrimoverse, I’m linking the wrimoverse pep talk instead of adding it to this. You can read that pep talk here. Well that’s it for now. Always remember that you are awesome! You are amazing! And you are stupendous!